Most people use camcorders out of the box with its internal built-in microphone. 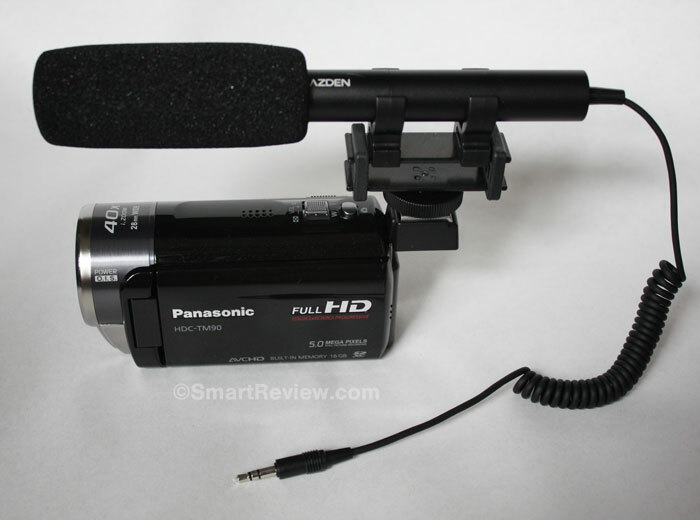 Microphones that come installed on your camcorder vary in quality and most will give you stereo sound. These built-in microphones have their limitations (like picking up sounds from the camcorder, or noises that come from holding the camcorder). External microphones can isolate the microphone from the camcorder and eliminate these problems. Anything you can do to improve sound quality will make a big difference. Sound after all is what makes our video experience enjoyable and brings you back to the moment. 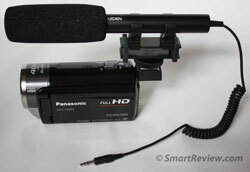 External Microphones: Many higher end and some mid-range camcorders have an external microphone (mic) input or jack. If your camcorder has this feature, you now have access to many audio options. Camcorders have what is called an accessory shoe (this is mounted on the top of the camcorder and can attach to an external microphone). Usually if you have an external jack, you have an accessory shoe. Professional camcorders usually already have an external microphone mounted which hooks up to the camcorder using what is called an XLR jack (which gives you high end sound). Omnidirectional – picks up sound from all directions. This is the most common type built-in to most camcorders. good for capturing sound from a group of people and all sounds in your general area. Lavalier (Lapel) – This tiny microphone is clipped onto clothing, as seen by news reporters, sports figures and other interview situations. Isolates the sound to the subject being interviewed. Shotgun (Directional) – Very directional type of microphone, which will bring in sound in the direction it is pointed. This type of microphone is best to use when you want to hear the sound only from your subject, and not sound from all directions. Background sounds are lessened. Can pickup sound from longer distances. Good for school plays, football games. Parabolic – A specialized microphone with a parabolic reflector which allows you to amplify and hear sounds from a long distance. Commonly used to hear players in a football game from the sidelines, and nature recording. Wireless – The wireless microphone allows someone to walk around (without wires) and use either a clip-on lavalier mic, or a handheld reporters type of microphone. This allows you to record audio much farther than the built-in microphone can pick up. You can take candid shots where the camera is 50-100 feet away from the subject(s). Dealing with wind noise: When shooting video outdoors, the most troublesome problem is wind noise. The wind will blow against the metal or plastic frame where your microphone is located and create a background noise that can blot out all the natural sound that you want to shoot. One solution is to block the wind by standing behind a windbreak (a wall, or other structure), or using your body (by putting your back to the wind). You can also stand where the wind impacts the microphone less. To monitor the sound you would need to hookup headphones or earphones if your camcorder has a headphone jack. Many camcorders have an electronic windscreen built-in which electronically tries to reduce the impact of wind noise. This helps, but not nearly as much as other methods. Deadcat and Foam Sleeves: There are two other ways to block wind noise without moving your position. That is to get an external microphone with a foam sleeve accessory that can slip over the microphone (included with most external mics). Foam can reduce wind noise substantially. The other option is to place a deadcat over your foam on the microphone. A deadcat looks like a furry sleeve that can greatly reduce the wind noise reaching the microphone and is what professionals use. Recording loud music/concerts: When taking video of very loud music you will need to adjust sound levels in your camcorder (if your camcorder allows this option) so it is not blown out and distorted. Usually sound levels that will be distorted will show up as red bars on your sound level screen on your camcorder (as the image on the left shows). You need to normalize audio input levels to get undistorted sound when you playback the video. Look for a camcorder with manual audio control. Another option is to get a portable audio recorder (see below) and place it in an optimum position and adjust the audio levels. Later you can synch your audio with the video you shot. Get the microphone close to your subject: One important aspect of good sound, is to get as close to your subject as you can. Having a wide angle lens on your camcorder will allow you to get closer (without appearing too close). In movies, professional sound operators use boom sticks to get the microphone as close to the actor as possible. If you want to get a long shot, but still get the subjects to sound good, get a wireless microphone, or a long extension for your microphone and mount it on a mini tripod (placed out of the video frame, but close to your subject.) or use a boom stick (long pole with microphone on the end). Monitor your audio with Headphones: If your camcorder comes with a headphone jack, you can monitor the audio to make sure it sound right throughout your video session. Portable Audio Field Recorder: If you are really serious about getting great audio, you can purchase a portable audio recorder, such as the Zoom H2 recorder which is a standalone recorder which can record great stereo audio with its built-in microphone. It also allows you to adjust the audio manually, and you can plug-in external microphones to the device. Since its audio is separate from your camcorder, you must synchronize its audio with your video later when using your video editing software on your computer. You can record using your built-in camcorder mic and also use this device to get different perspectives and locations of sound that can be mixed in later.